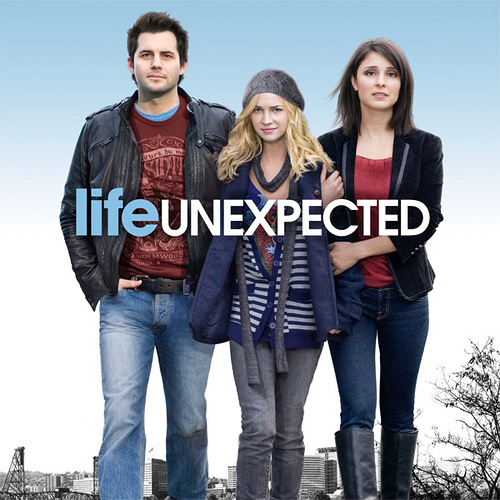 Just had to give a shout-out for one of my favorite new shows on TV, "Life Unexpected". It was a mid-season replacement last year on the CW and was renewed for a partial season this year because of its grassroots fan support. Without getting too detailed here...the show centers around an "Unexpected" family. Lux, a teenager who has been in foster care her whole life, finds her birth parents...two somewhat "lost" 30-somethings Cate and Baze. Cate a successful DJ, and now producer, on a popular radio show; and Baze, a stereotypical man-child bartender-turned-businessman. No Cate and Baze are not "together", but their chemistry is palpable (and, yes, they are secretly in love)! So, both the drama and the hilarity ensue as this unlikely trio learns to become a family. Many emotional ups and downs with this show: You will laugh. You will cry. Either way, you will be cheering this family on all the way! I haven't seen such a heart-felt show in a long time!!! A show about the roadblocks in life that you can triumphantly overcome when you have love and support...even if you do have to stumble your way to your victory. Just had to do a shout-out and rave...as I know the show is hoping to be renewed the rest of the season! So, please tune in and show some support! Its on Tuesday nights on the CW! Check it out!!! Here is a short clip...just to get you interested!!! Can't wait for tonight's episode!! !